Adult ADHD is not the same as childhood ADHD. Most people with adult ADHD never had childhood ADHD and most people with childhood ADHD never will have adult ADHD. This past year what was long thought to be known about adult ADHD turned out not to be true. Indeed, up until DSM-V adult ADHD could not be diagnosed unless someone had previously met criteria for childhood ADHD. DSM-V changed this requirement so that all that is needed is the presence of “several symptoms” of ADHD prior to age 12. A series of studies from several countries have recently been concluded to look at what happens to childhood ADHD patients, and whether adult ADHD patients are related to childhood ADHD patients. They are listed below. What is clear is that the two conditions are not a perfect match. 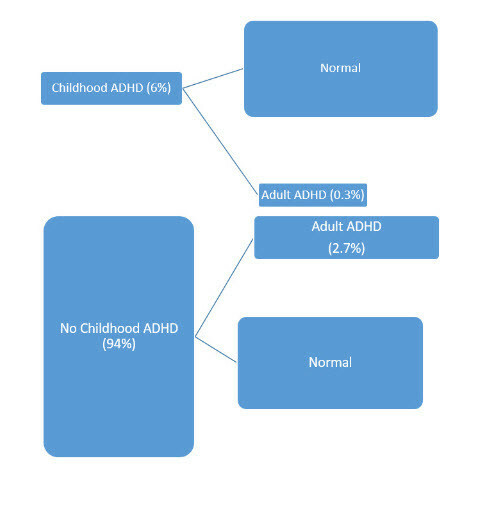 What is not clear at this point is whether this is because the criteria for childhood ADHD are too strict (leaving out some patients with mild symptoms who develop full blown symptoms later on) or whether there is, in fact, such a thing as pure adult ADHD, meaning a condition that has no childhood prelude at all. This picture illustrates the results from one of the studies (Moffitt, et al, 2015 and 2016). What you can see is that the overwhelming majority of the adult cases did not meet diagnostic criteria in childhood. Some commentators have reviewed the data from these studies and pointed to evidence of sub-syndromal problems with school performance in childhood in those who later develop adult ADHD, but then, since these studies used DSM criteria for diagnosis, that would have to be the case. DSM-6 will obviously have to be preceded by a good deal of research work designed to determine whether there are people who develop adult ADHD with no childhood symptoms. Faraone SV, Biederman J. Can Attention-Deficit/Hyperactivity Disorder Onset Occur in Adulthood?. JAMA Psychiatry. Published online May 18, 2016. doi:10.1001/jamapsychiatry.2016.0400. Caye A, Rocha T, Anselmi L, et al. Attention-Deficit/Hyperactivity Disorder Trajectories From Childhood to Young Adulthood: Evidence From a Birth Cohort Supporting a Late-onset Syndrome. JAMA Psychiatry.Published online May 18, 2016. doi:10.1001/jamapsychiatry.2016.0383. Agnew-Blais JC, Polanczyk GV, Danese A, Wertz J, Moffitt TE, Arseneault L. Evaluation of the Persistence, Remission, and Emergence of Attention-Deficit/Hyperactivity Disorder in Young Adulthood. JAMA Psychiatry. Published online May 18, 2016. doi:10.1001/jamapsychiatry.2016.0465. Adult Onset ADHD Symptoms – What Do They Mean?